Blossoming Belly Lotion Bar is made to keep bellies hydrated and protected, which helps the elasticity of the skin as it grows and assist the prevention of stretch marks and scarring. A womens genetics do play a large role in the elasticity of the skin, however keeping the tummy well moisturized as it grows around the new little one will definitely help. Blossoming Belly Lotion Bar has many of the wonderful natural ingredients that have been found to help the stretching process, while not having to deal with lotions or creams which can be messy if moisturizing throughout the day. 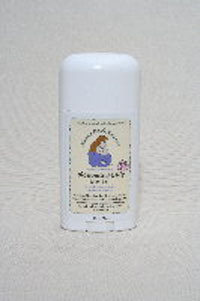 Blossoming Belly Lotion Bar is very neat to use and easily stored at the workplace, in a purse or gym bag, or in the car. 2.5 oz lotion bar. Ingredients: Coconut oil, Monoi de Tahiti, shea oil, avocado butter, mango butter, cocoa butter, certified organic sunflower oil, jojoba, evening primrose, rosehips, helichrysum, lavender, calendula, chamomile, and vitamin E.